A beautiful kale. At first I thought it was arugula, but they said, no, it’s kale. 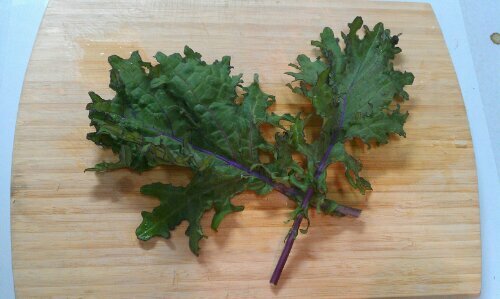 Throughout all the different vendors last saturday, there were about 5 different types of kale available. This was the one I bought. It had a little peppery bite, like arugula. For $2.00, you can buy one bunch of kale. Great deal. When I got home and washed the kale, I was pretty surprised at how much kale was actually rubber banded together; about 2 to 3 times the amount of what you would get in the store. I have a lot of soups in the freezer, so I was looking for something else to do with the kale, and thought about Spanakopita. I haven’t made these in years, but there are a real treat, and one of my husbands favorite. I followed a traditional spanakopita recipe. The only hitch was that when I pulled the box of filo dough out of the freezer to thaw, it wasn’t filo, but puff pastry. I went ahead and went with it, how bad could it be? Also, it saved me the stress of working with the filo dough. I used 3 different types of cheese here: a pecorino pepato, a very mild sheep’s milk feta, and the every rich fontina. Saute minced white onion in oil and butter in skillet. When translucent, add green onions. Add kale and spinach, and stir from bottom up till cooked down. Do not overcook the spinach. Remove from heat and let cool. 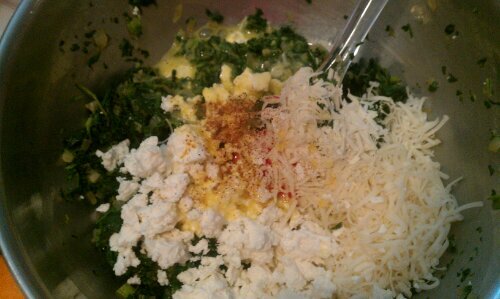 Add cheeses, nutmet, one egg, and lemon juice, and mix well. Cut dough in approximately 3 to 4 inch squares. Place a few tablespoons filling in the center. Brush edges with egg wash, and seal. Follow directions on pastry package for baking. I baked mine at 375 in a convection oven for about 15 minutes. I tried different shapes, and they all worked fine. On some, I had to use a fork to seal the edges because I had put too much egg wash.
Also, these freeze well unbaked. Freeze on wax paper or parchment lined cookie sheets, then transfer to a container, using the paper to separate the layers. A very thoughtful gift from my mother. Knowing how much I love roses, she has been working on these for the last few months. Now I will have a Rose Garden to enjoy year round. Thank you, Mom!